If you need a higher ratio of marzipan to chocolate, I'd recommend keeping an eye open for "Marzipanbrot" in the upcoming holiday season if there's an establishment around that imports German holiday articles :). It's a bread-shaped marzipan log (Brot=bread) with a dark chocolate shell, so it's got a high marzipan ratio and might fit the bill. I have to say Ritter Sport Marzipan is my favourite marzipan chocolate ^^! 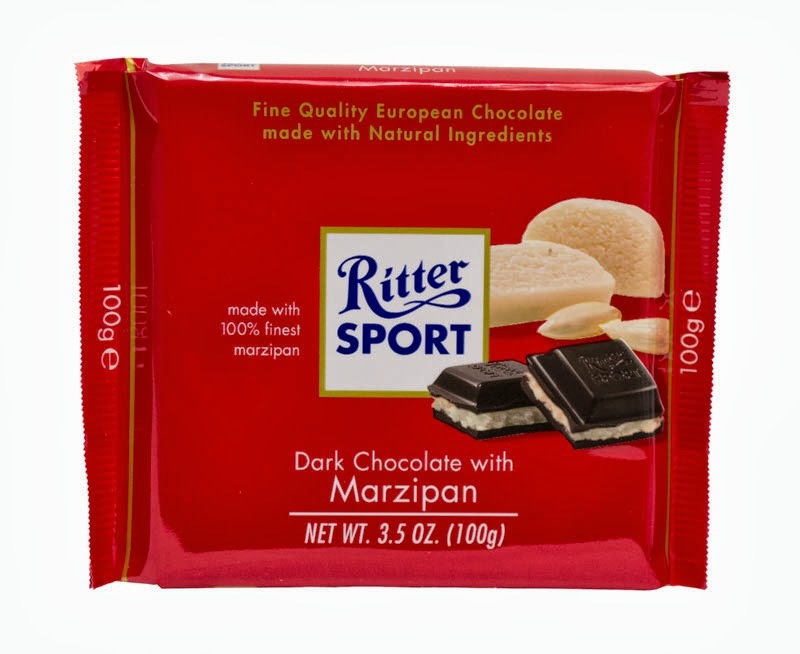 Generally, Ritter Sport is my favourite when it comes to consumer level chocolate, but the marzipan is especially good (and I get to eat my flatmate's when she buys the mini mix :p). Yes I agree, Ritter Sport is nice chocolate, I like it. And yeah, darker chocolate is better with marzipan. And if you want marzipan with something like oblaat, maybe you should search for "marzipan kartoffeln" (marzipan potatoes), they're common in germany (especially around christmas), and are balls of marzipan, coated with a very thin layer of cocoa powder. Aldi brings in German sweets around Christmas; if there's one near you, try checking there for Marzipanbrot (and many other exotic goodies, for that matter!). I absolutely want to look for both marzipanbrot and marzipan kartoffeln. I'll probably have to check Cost Plus World Imports since we don't have Aldi in my area.